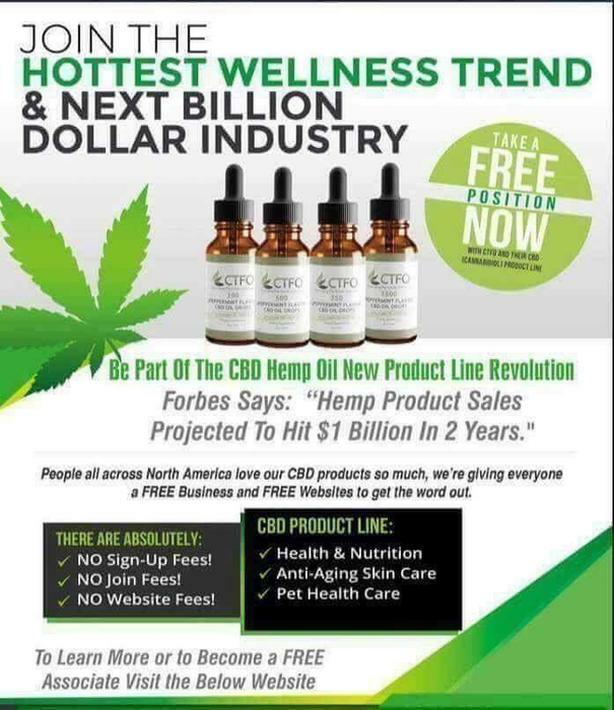 Would you be interested in working from home with the hottest hemp company today? If you want a sustainable, legal business with residual income....this is it! Be your own BOSS. Help people and generate income while doing it! Timing is everything and you've found this at the right time! According to industry analysts the hemp CBD oil market is expected to boom to $22 Billion by 2022. Want a piece of it? Well you are in the right place. ~A FREE turnkey business opportunity. ~Free to join! Absolutely NO startup costs! ~Free marketing website setup and maintained for you. ~No inventory required. Orders drop-shipped direct to consumer. ~Free ongoing training and mentorship. ~Over 70 products to choose from! Highest quality with most competitive prices! ~Current third party lab reports on ALL our CBD oils. ~We offer a 60 day empty bottle money back guarantee. Unheard of in the industry! ~Copyrighted, Fair, Compensation plan that allows you to start earning money right away. This is NOT your typical pay plan. There are NO binary legs to balance and NO expensive monthly autoships! Wait until you watch the compensation plan video, you aren't going to believe what you are watching! We are looking for motivated, self starters that are willing to put in the work.